Our fiberglass entry, storm, and patio doors are energy efficient, durable, and available in a wide selection of styles and colors. Keystone Window offers a variety of custom-made doors, from storm doors to entry doors to several different types of patio doors. All of our doors are made from fiberglass because of its strength and durability, and are manufactured by the same company that builds our top-quality windows. You can rest assured that these doors measure up to our high measures of standard. They’re energy efficient, provide strength and security to your home, and are durable enough to be protecting your home for many years to come with only minor maintenance and cleaning. In addition, all of our doors come with a variety of aesthetic options, such as decorative glass and a wide selection of color choices, and will make a beautiful addition to your home. Sliding Patio Doors: Half of this patio door is fixed in place, while the other half slides open over the fixed portion. It’s an excellent source of natural light. Hinged Patio Doors: This patio door has either one or two fixed glass panes, and one pane that swings either in or out on hinges. It’s a great way to access your porch, patio, or pool. French Patio Doors: A French patio door has two glass panes that are hinged on the outside, allowing both panes to swing either in or out from the center. It’s the perfect door to let lots of fresh air into your home. Entry Doors: An entry door will give visitors a beautiful impression of your home, while providing security to strengthen your home’s first line of defense. 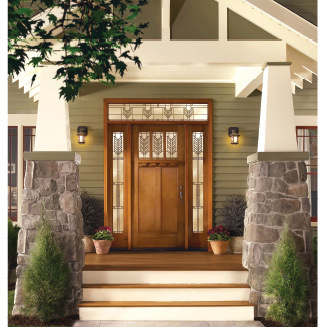 Storm Doors: The StormWeld™ Storm Door we offer is the strongest in the industry. It’s strong an durable, and will provide security for your home long into the future.